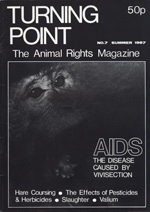 Turning Point only produced two issues in 1987 due to a delay in an NAVS report claiming (probably erroneously) that AIDS was an unintended result of vivisection. 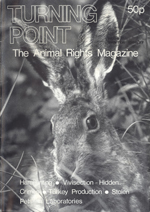 The editors of Turning Point believed (absolutely erroneously) that the report was going to be “devastating,” and “the most important campaign that the anti-vivisection movement has ever undertaken.” By 1988 the campaign had fizzled out, but sadly pseudo-science conspiracy nonsense in the world of animal rights didn’t die with it. Fortunately, plenty of other content made it into these pages, much of it worth reading. 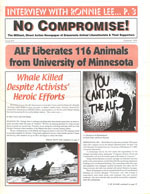 Direct action campaigns from around the world are covered, with mentions of Earth First!, the Central Animal Liberation League, and the Animal Liberation Front. Investigations, essays, and photographs of liberated donkeys take up the rest of the real estate in this brief volume. 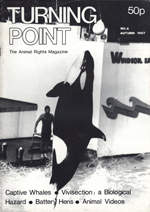 After a brief run as “Black Beast,” Turning Point emerged as England’s foremost animal rights publication in 1986. Featuring first hand accounts of direct action, a decent analysis of systemic animal abuse, and a willingness to be controversial, Turning Point documented all of the major animal liberation events of its era. 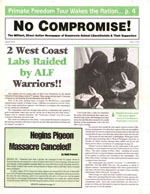 Issues #5 and #6 give coverage to mainstream media distortions of AR activism, CALL’s brilliant raids of Park Farm, ALF strikes across England (Including the liberation of three otters!) and so much more. 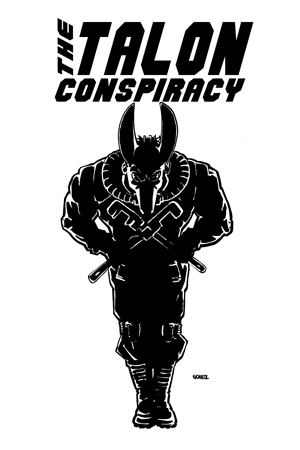 There is even a brief mention of the Farm Freedom Fighters, the first group to raid a factory farm in the United States. Interestingly, their media relations were handled by none other than Farm Sanctuary. These two volumes are markedly better than the Black Beast issues that preceded them, and all of us at TALON are excited to finally preserve them in our archive. 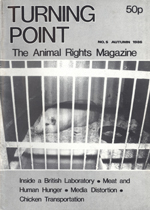 Published 11 years after the Silver Spring Monkeys investigation, in the same year as the Animal Enterprise Protection Act and 14 years before the Animal Enterprise Terrorism Act, Targeted, was intended as a vivisectors manual for managing animal rights philosophy. 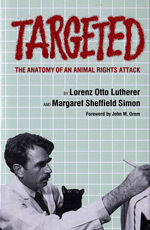 Lengthy and replete with victimization, which includes comparing vivisectors to Jews in Nazi Germany, the book is a vital resource for two reasons; it signals the beginning of a new industry, the animal enterprise security industry, and also provides a starting point in charting the rhetoric of “terrorism” to explain animal rights activism. The animal enterprise security industry, and it’s growth, comes as a fairly predictable response to campaigns, investigations, releases and sabotage. The industry has raised security costs for animal enterprise, however, fails to provide much in the way of relevance. Current publications, like Extremist Watch in the United States, do little more than assauge the conscience of the industry and Targeted can be read in this vein. As a psychological study, the book is written more as a rationalization of vivisection, and the victimization of vivisectors themselves, than a real manual. Unsurprisingly, vivisectors could learn more from content on this site than they ever would within industry manuals, and even still, that knowledge would not be sufficient to prepare them. In terms of efficiency, one has to question if these manuals and the security industry has the desired effect. The most troubling message to chart in the book is the framing of animal rights activists as “terrorists.” Written in the same year as the Animal Enterprise Protection Act was passed, the manual would be foreshadowing that the industry was not about to stop short of this language. It is frustrating to see the amount of organization and lobbying that has happened since the book was published, as the authors main strategic point is that the industry itself must be united and it must develop it’s political network and backing. 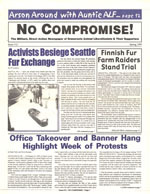 That strategic line can be traced back to publications like this and explains the current situation wherein the vivisection industry is allowing small public relations reform that drains animal advocacy resources (releasing animals for adoption instead of euthanizing them, usually done within a time frame and without aid from the institution) alongside education campaigns (namely billboards) while solidifying their political power by uniting with other animal enterprise industries with designer bills like AETA, AG Gag Bills, etc. This manual is a must read for those interested in charting the vital work of people like Will Potter, who, with his book Green is the New Red, has chronicled industry response and Government repression. Also, for those interested in the psychology of vivisectors and the vivisection industry, in between the lines this manual reads like a diary and is full of useful information.